We now interrupt our regularly scheduled programming to offer a special deal on Cypress Bark Mulch. We have an excess supply and need to unload. Actually, my favorite tree got blasted over the weekend. Our comic for this weekend comes from the feature Out Our Way by J. R. Williams. 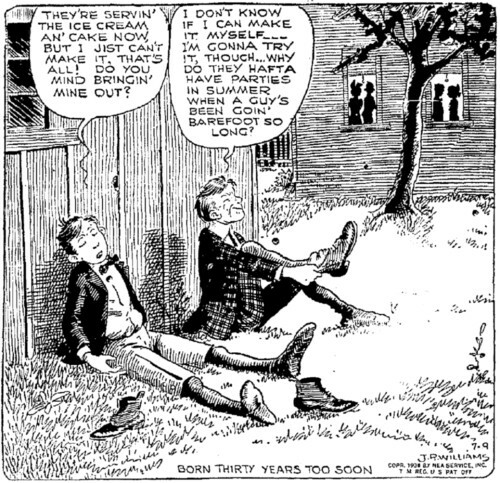 This one appeared on July 9, 1938. That was a time when they still remembered the torture of putting shoes back on after having been barefoot for so long. Yesterday I presented the New York Times story about Harold Smith, whose father Victor petitioned the Jersey City Board of Education to allow Harold, age 10, to go barefoot to school there. Here’s another story, also from before the Board met to decide his fate, with a bit more information. Here’s a story from June of 1969, from the time when hippies and bare feet were in full swing. And those in authority were not reluctant to arrest you for going barefooted, even if they had to make stuff up.